/ Is Fruit Bad For Losing Weight? So is eating fruit really that bad? and does it cause you to gain weight? Then the humble fruit bat is in serious trouble. in bat caves around the freaking world on the above logic. 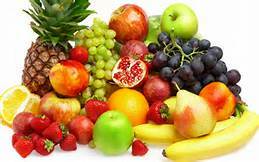 But seriously, fruit is one of the most nutritious foods you can eat and by and large is relatively low calorie. Basically, what i see is that we live in FEAR of eating certain foods when actually for most people, they are perfectly fine. Fruit doesn’t make you fat and it’s perfectly fine to eat.